Could 2013 Finally Be The Year For Flying Turns? We’ve all been waiting seven years, and we may not have to wait much longer. We’ve heard for a little while now that testing has been going on at Knoebels with the infamous bobsled coaster. 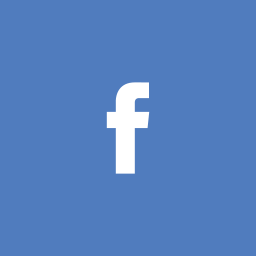 However, POV footage released by the park via Facebook reinvigorates enthusiast hopes that we may get to see Flying Turns open in the near future. Current rumors point to a possible Labour Day opening date for the park’s issue plagued project. 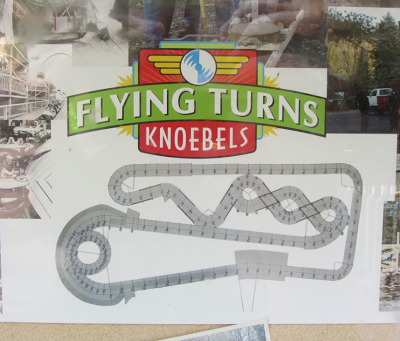 Knoebels has not made any official statements regarding whether in fact the attraction will open this season. In a recent video featuring the Cedar Fair CEO Matt Ouimet and VP of Planning and Design Rob Decker, at the Clermont Steel Fabricators plant, where Gatekeeper’s track and keyhole elements are fabricated. They talk about the process of creating Gatekeeper, and you also get to see some great shots of B&M track in fabrication. 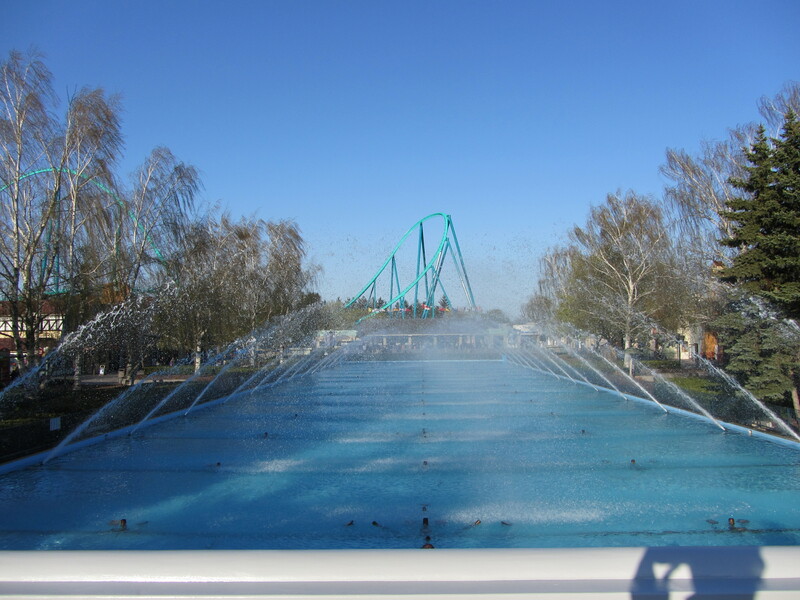 At 3:19, Matt Ouimet mentions some enhancements to the entrance fountains at Canada’s Wonderland. This leads me to think, what are they going to do with the fountains, and will it be for this season? Right now the fountains are stationary, going off at sequenced intervals, but I can see some moving fountains like in World of Color at Disney California Adventure. Think about it, Matt Ouimet has his focus on family attractions, so it would only make sense to make the fountains into something a family can really enjoy, and maybe turn it into a night-time show. Who knows, maybe this is correlated with the Mamba trademark? Probably not, but since we don’t have anything confirmed for it yet, it was worth a shot. Here’s one of my favourite videos of World of Color, as shot from a fixed-wing aircraft above the park. Maybe we’ll see something like this at a Cedar Fair park near you in the future. 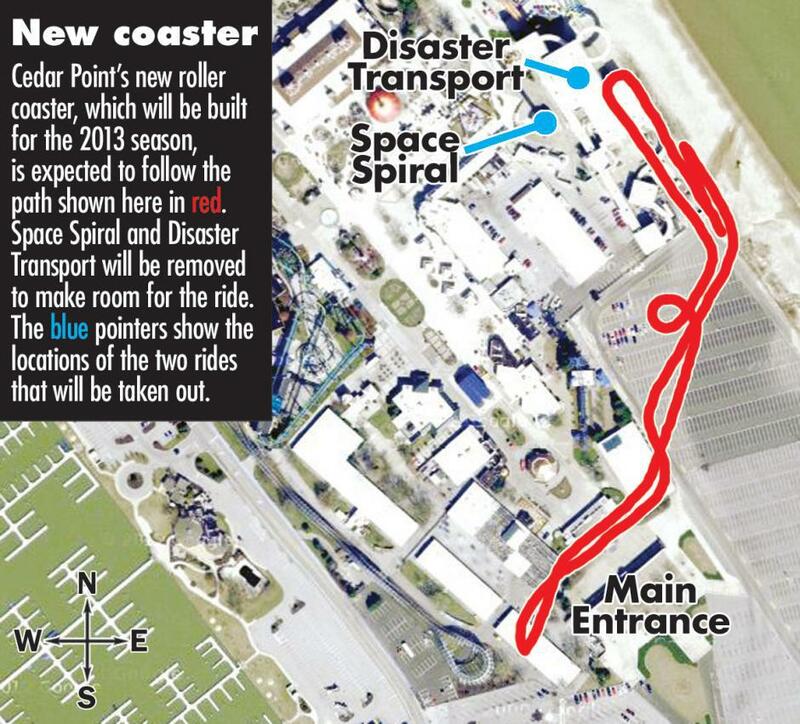 What is Cedar Point Up To for 2013? Cedar Point hasn’t put in a new coaster since Maverick in 2007, and every year since then, rumors have circulated saying that Cedar Point would be building a new coaster for the upcoming season. Earlier this year, we learned that Cedar Point would be removing Wildcat from the park, in order to encorperate an “expansion to Celebration Plaza.” But, in a recent turn of events, we may be seeing that new rumored coaster come to fruition very soon. Recently, we’ve learned from the Sandus ky Register that the park plans on investing a monumental $25 million on a record-breaking, 170ft tall B&M wing coaster, and restructuring the entrance. Now, this is a bit of a “deja vu” for me as the park did in fact remove White Water Landing to build Maverick, but surely the park can find a way around removing such classic rides like Disaster Transport, (arguably the park’s only dark ride,) and the Space Spiral observation tower! Just the other day, the Facebook page Keep space spiral at cedar point posted this rendering of a possible layout for the new wing coaster, and if this really is the layout, I can see that it WILL impact the park’s entrance like Leviathan does at Canada’s Wonderland, but oddly it doesn’t seem to impact Space Spiral at all, and yet it it slotted for removal. Additionally, if the entrance were to be pushed over towards the beach, both Disaster Transport and Space Spiral could be kept! 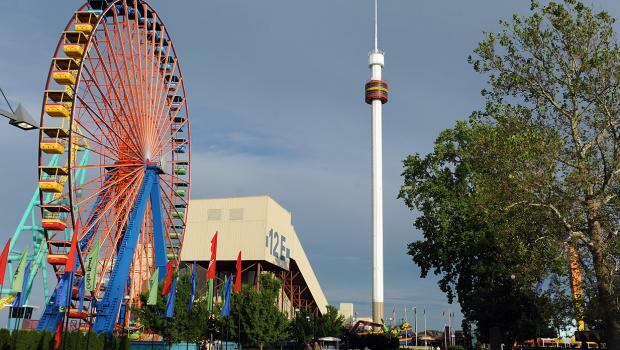 Or, if the layout were to change just a little, Space Spiral’s location could be used as the entrance, and the observation tower could just be relocated like Ocean Motion was for Windseeker! So in short, the park already removed Wildcat, dropping the park’s coaster count to 16, and now they’re planning to remove Disaster Transport AND Space Spiral, all for 1 rumored coaster? Maybe we’ll see more than this wing coaster next year? Either way, something weird is in the works at Cedar Point for 2013. One final point I have to make is that many, (like me,) are opposed to the removal of Space Spiral and Disaster Transport from Cedar Point, so there are a bunch of Facebook pages dedicated to raising awareness of the situation! Check out Save-Disaster-Transport-and-Space-Spiral-at-Cedar-Point on Facebook right now!!! Reverse Mr. Freeze for 2013? It looks like Superman: The Escape isn’t the only coaster to be reworked by Six Flags with backwards launches, according to Screamscape, we might see the Mr. Freeze coasters launching reversed trains in 2013 season. Recent rumours state that next year, at Six Flags St.Louis and Six Flags Over Texas, the Mr Freeze coasters will be launching trains backwards. Currently, both rides are closed, and as stated below by Screamscape, something is definitely brewing for next year. Guests to visited SFOT over the weekend for the start of that market’s Spring Break, confirmed that not only was Mr. Freeze closed, but there was a sign at the entrance of the closed ride stating that there would be an exciting announcement coming soon. 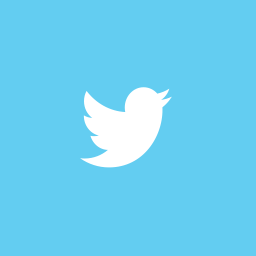 Don’t forget to voice your opinion in the comments!